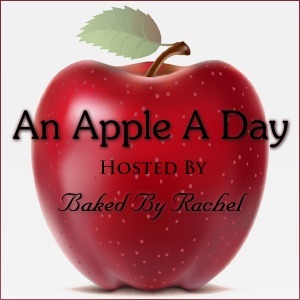 It seems perfect that the first guest poster for An Apple A Day is one of the first blogger friends I made. Amanda of Fake Ginger is quite possibly one of the sweetest people I’ve met. She’s funny, down to earth and is a Momma to three too! If you don’t know Amanda’s blog, you should. She’s always whipping up something extra special. Hey y’all! I’m happy to be over here talking about apples today! I absolutely love apples – we go through at least a couple dozen apples a week in my house – but I very rarely bake or cook with them. 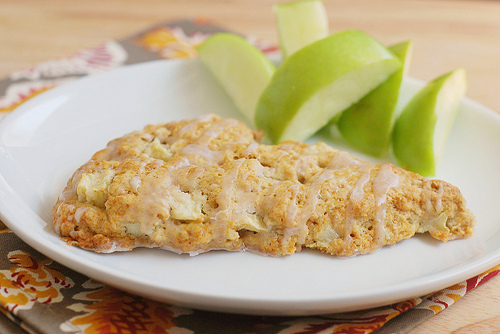 So this little apple party was a good excuse to bake something fruity and fantastic! I made scones! Because I love making scones. And I love eating scones. Win win. These are really great. You know how a lot of times when you buy coffee shop scones they’re a little tough and crumble apart all over you? Well these are so tender and definitely won’t be crumbling when you break off a piece! I think it’s the moisture from the apples that keep them nice and soft. 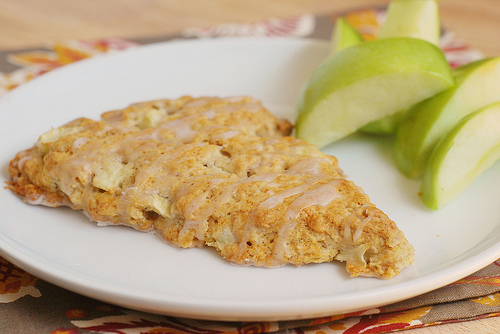 Scones are surprisingly simple and quick to make. These took less than an hour to make and as obnoxious as this may sound, they’re definitely something that could be made on a weekday. Paired with an egg or some fruit they’re a great little breakfast. Preheat oven to 400F. Whisk together flour, oats, brown sugar, cinnamon, nutmeg, baking powder, baking soda, and salt. Cut in butter with a pastry blender or rub in with your fingers. (The largest pieces should be the size of small peas.) Add apples and buttermilk, stirring until dough just comes together. Turn out dough onto a lightly floured work surface. Pat into a 6-by-8-inch rectangle, and cut into triangles (or desired shape). Place about 2 inches apart on parchment-lined baking sheets. Bake until golden brown, 20 to 22 minutes, rotating sheets halfway through. Let cool on sheets for 15 minutes before glazing. To make the glaze, whisk together powdered sugar, heavy cream, and cinnamon until smooth. Drizzle over the slightly cooled scones. You can find Amanda on Facebook, Twitter and Pinterest.